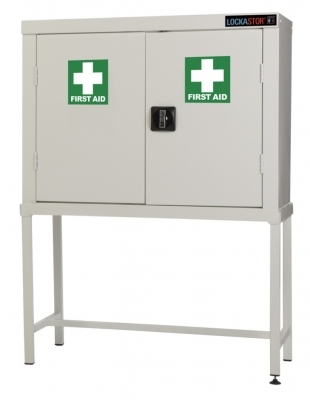 Lockastor, First Aid Locker 900x460x700, Steel lockable cupboards, for storage and easy access of First Aid products. Full steel construction fitted with master cam locks on each door. Doors fitted with strengtheners and rubber buffers. Finished in an epoxy anti-bacterial powder coat which helps to prevent spreading germs. Liquid tight sump for accidental spills. Relevant signage provided. Replacement locks and keys are available.